It was the second order, cost performance and durability are both excellent. This review is about item#35110004. We purchased for repair of old motorcycle that pure product was not available. This product has a wide variety of lengths, and there are things of 122 links that I was searching for, and I was saved without having to cut a long chain. This review is about item#40474156. I used it for a 125cc bike. Heavy duty is much more helpful than standard, as it saves maintenance work and is cheaper. Heavy duty seems to be good for strength in 125cc. This review is about item#35109995. As a replacement part of the 1978 Honda motorcycle. We used other seal non-seal standard, but want to try non seal of seal EK chain, HEAVY-DUTY type and purchase. There is no impression that I think that it is still impression as it has just been installed, but with the impression that I touched and the impression that I installed, I feel that it is a good quality for a low price. This review is about item#40474131. 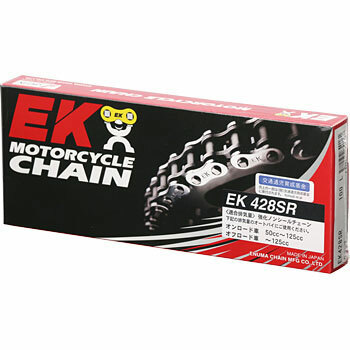 The EK chain is high quality and it is saved for cheap price. This review is about item#40474192. For small displacement vehicles, non-seals with little friction loss are good with less power loss. However, frequent maintenance is required for every ride. This review is about item#40474226. I always use it. It is a very good product. 428 size is not used other than this. This review is about item#40474174. There were also cheaper ones but I chose this because I could choose the number of links. Since you can save time and effort to cut, you can easily exchange chains with a single piece of pliers. I exchanged chains of two bikes. It is 110L and 124L, but since there was setting respectively, it can be used without cutting and it is very convenient. This review is about item#40474165.